The onset of the First World War hastened the demise of the Ottoman Empire, which had ruled the Middle East for five centuries. The colonial powers set their eyes on dividing the spoils. The film then moves to a small room in which British army officers gather around a table with a minister from the War office, the future British Prime Minister, Winston Churchill. The officers reluctantly agree among themselves, “That woman”. “That woman” is Gertrude Bell (left), a British archaeologist, writer, traveler, and a diplomat, who worked in a time of intense Western colonialism. After a delay of two years, the public finally has a limited DVD access to a motion picture that rescues Bell from the history books and should introduce her to a wider public. 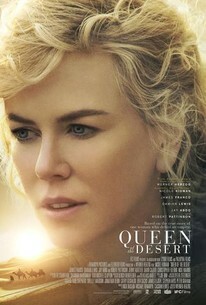 The film is Queen of the Desert, based on the real-life story of Gertrude Bell (1868-1926)(Nicole Kidman), a humanitarian among those human colonialist scorpions who were roaming the deserts in search of prey and profits. To the indigenous people of the region, Bell is better known, and far more appreciated, than T. E. Lawrence, portrayed by Peter O’Toole in David Lean’s 1962 film, Lawrence of Arabia. The difference between the two? Bell was a woman and a natural diplomat, while Lawrence was a male warrior, glamorized through David Lean’s film. Lean’s film rescued Lawrence from oblivion, which Queen of the Desert should have done for Gertrude Bell. It has failed to do so, not because of its lack of merit, but because the film industry determines what it thinks will sell. Our popular understanding of history is shaped through popular culture, where films, television and now, social media, play definitive roles. Military exploits have a greater popular appeal than diplomacy, while a film depicting Arab history as it really was, colonial exploitation of indigenous populations, goes against the popular narrative. Gertrude Bell was an exception to the norm. She actually cared about the people of the Levant. Her books, and books about her, underscore this. What was it that kept the film Queen of the Desert from the public for two years and then only grudgingly granted it very limited distribution? No one is saying. The fact remains, however, that Hollywood knew the story of Gertrude Bell violated a narrative written and protected by Zionism. Levant history before 1947 was of little consequence, a period best left unexamined. Queen of the Desert was initially screened in 2015 at the prestigious Berlin Film Festival. It was nominated for the festival’s highest award, the Golden Bear. Directed by noted German director Werner Herzog and beautifully photographed on locations in Jordan and Morocco, the film was a natural for American “art house” screenings. With Nicole Kidman (above) as the film’s star, and a script by Herzog, which examined the role Gertrude Bell played in modern history, film companies should have battled for U.S. distribution. They did not. Films that violate the conventional historical narrative do not sell, or so it is assumed by the historically ignorant decision-makers of Hollywood. The film focuses on a Middle East before Israel entered the historical stage. Could that reality play a role in Hollywood’s reluctance to embrace Queen of the Desert? I am reminded of a West Wing episode in which President Bartlett was given an authentic map of the Levant from 1709, the region which Gertrude Bell came to love centuries later. “You can’t do that, some people will be offended because Israel is not on the map”. Puzzled, Bartlett said Israel did not exist when the map was made. “Doesn’t matter, some people will be offended”, was the insistent response. (click below to see a short clip). The Desert Queen covers history in the World War I era. Israel did not exist then. Israel did not exist until the United Nations yielded to Zionist pressure and declared Israel a state in 1947. That could explain why after its 2015 festival showing, Queen of the Desert dropped from sight. A Nicole Kidman film was shelved for two years. When Queen of the Desert had its limited run earlier this year, it finally surfaced. There was still money to be made so the film now has DVD exposure. On October 3, Netflix and sites like Amazon, began renting or selling copies. Gertrude Bell was there when the modern Middle East was formed. Because of her personal and caring knowledge of tribes and their leaders, she was used by the victorious nations after World War I to draw borders and choose leaders who became kings. A sensitive film which examines the life of one of the most significant women of the 20th century, is ending its journey deep into the archives of film history, a journey noticed by only a few. 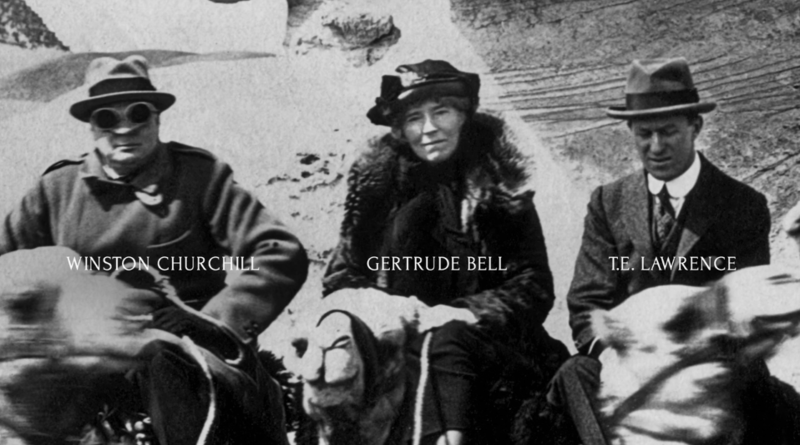 The picture above of Gertrude Bell between Winston Churchill (left) and T.E. Lawrence, was taken in Cairo, Egypt, in the early 1920s. It is an unfortunate fact of history that this photograph is viewed as one of a future British Prime Minister, the real “Lawrence of Arabia”, and “that woman”. The film industry missed its chance to give Queen of the Desert, the story of Gertrude Bell, the same prominence it gave Lawrence. Is there yet another perilous journey to be made that would jar Western culture and its leaders into the reality of the Levant? The answer is yes, but not until Zionism loses its grip on its version of the region’s narrative. And not until humanitarians in the spirit of Gertrude Bell, reshape our understanding of history back to what really happened. This entry was posted in -Movies and politics, Middle East, Movies, Uncategorized. Bookmark the permalink. Once again, you are spot on, Jim. In the not too distant future let us hope that the reality of the Levant will be widely known. What an interesting revelation. I had only read a brief article about Gertrude Bell a couple of years ago, for the first time. Perhaps it was to do with the movie you referred to, Queen of The Desert. Her role strikes me as most unique, mysterious, and curious, particularly because of the combination of geography, culture, and gender. I would love to know more about her life and what motivated her to take up such a rigorous journey. I will get the movie for sure. As you know, we have had some very interesting British – and other so-called “Arabist” characters roam the deserts of the Middle East. Some turned out to be Arabists, or soldiers of fortune, or spies, or artists or adventurers, or some combination of sorts. As you mentioned, T.E. Lawrence was the most famous – or, infamous – of them. There was also “Glubb Pasha” (John Bagott Glubb) who had a major role, not only in Jordan, but also as relevant to Palestine (“Soldier With The Arabs”), and the creation of Israel. He founded the famous Arab Legion, in what was Trans-Jordan in the 1930’s. Why create awareness that there was NO “Israel” on the map for well over 2000 years before its creation in 1948? Let the West – particularly the US – remain blind when it comes to historical facts of the Holy Land. I would like to also add that, not all of the characters who showed sympathy for the Arab tribes, or Arab communities, were necessarily working for Arab freedom and independence. The role of some was the exact opposite. I wonder who the real Gertrude bell was? Thank you so much for informing your readers of this film. This is excellent Jim and what an appropriate time to bring up this issue. It just confirms how the US is psychologically occupied by our physical occupiers. At last!! I’ve been looking forward to seeing this movie for a long time. 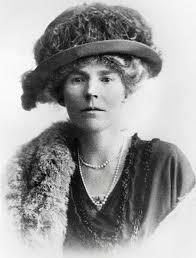 What a woman Gertrude Bell was!! If only the Lloyd George cabinet had listened to her and followed her advice, decades of slaughter and theft of Arab land (i.e., Palestine) and dispossession of the native inhabitants would have been avoided and the world itself would be in much better shape than it is. I found this on Kodi not too long after its release (where it’s probably still available, for those using Kodi). As the article notes, it mysteriously vanished once the U.S. rights were acquired. It’s a pretty good movie, even though I think it focused a bit too much on Gertrude Bell’s dalliances, apparently in an attempt to add some romantic flavor to the film. Other than that, it seems a pretty accurate portrayal to me. It fit within my framework of knowledge, but I have to admit I’m hardly an expert on her life. If anyone is interested, her writings in “The Arab War” are available for Kindle free on Amazon.